Teddy is a large, gray-brown dog who enjoys his life as “leader of the pack,” until he receives the unwanted present of a cat companion. The big dog’s first-person narrative is written in an overconfident, boastful tone, presenting him as “charming and fetching,” though he is proud to say he “never actually fetches.” He never takes off his sunglasses as he moves from one mischievous mess to another: upending a hot dog stand, putting his paw prints on a freshly painted house, and getting into the neighbor’s trash can. But Teddy’s life changes when his aunt sends him a huge package containing a cat that needs a new home. Teddy tries to indoctrinate Penelope the cat in his idea of proper (canine) behavior, but she has her own way of doing things. In a characterization-defying conclusion, Teddy decides to cooperate, take a nap with the cat in his favorite armchair, and bump paws together, which he considers acting like a cat. Teddy’s annoying, superior attitude falls flat, as he just seems full of himself rather than funny. 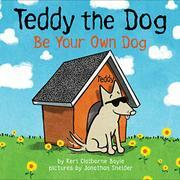 Bold cartoon-style illustrations provide some humor with Teddy’s antics, but he never really comes alive as a character due to the sunglasses covering his eyes in all the illustrations. Penelope, or Fishbreath as Teddy calls her, has more personality, but she is unbelievably pliant for a newly arrived cat.